Honor recently unveiled the Honor 10, and in addition to impressing the media, it also seems to have one of the best price-quality ratios of the year. How is it different from its predecessor? Does it stay true to what the brand stands for and manage to leave the Honor 9 in the dust? Find out in our comparison. Honor 10 review: Watch your back, OnePlus! Neither the Honor 10 nor its predecessor are available for purchase officially through the hihonor US online store. You can still buy both devices on Amazon.com though. The Honor 9 sells for $499, while the Honor 10 goes for $599. If you don't mind paying $600 no questions asked, then the Honor 10 is a no-brainer. But, if you like the idea of paying $100 less, then the question becomes: What do you get for the extra $100, and does that make the price difference worth it? Visually, a difference is obvious. 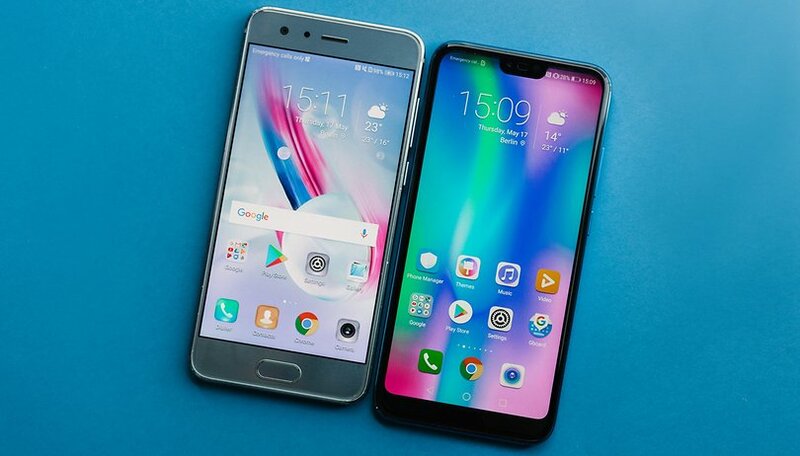 The more recent Honor 10 follows 2018 fashions, while its predecessor is stuck in the olden days: the Honor 10 uses a 19:9 format while the Honor 9 uses 16:9. For those who don't know what this means, the screen takes up most of the front panel, while on the Honor 9, the lower and upper bezels are much more pronounced. On the inside, we also find a difference in size: because of its age, the Honor 9 comes with Android 7.0 Nougat. Of course, you can update it to get Android 8.0, but the Honor 10 offers Android 8.1 out of the box already. As for the camera, you can quickly see a difference by looking at the back of the smartphone, since the module has changed: while the Honor 9 kept the lenses separate, the Honor 10 places them both in the same elongated oval module. The configuration is also more elaborate on the inside, since the Honor 10 offers not only more megapixels (16 + 24 rather than 12 + 20), and a larger aperture (f / 1.8 and not f / 2.2) . At the front, the number of pixels also increased from 8 to 24, but the aperture remains at f / 2.0. In practice, the photos of the Honor 10 are superior to those of the Honor 9, and the camera uses AI. The Honor 10 is a recent smartphone that flirts with the high end. When it comes to the spec sheet, this means that the device has recent hardware able to compete with other high-end devices on the market. Specifically, we find the house SoC which is also used on other Huawei flagships (for example, the Huawei Mate 10, Mate 10 Pro, P20 and P20 Pro): the Kirin 970. It is true that this chip, in itself, is not necessarily brand new since we saw it arrive with the Mate 10 at the end of 2017, but it remains the most recent from Huawei's subsidiary HiSilicon. The Honor 9 uses a an older SoC, the Kirin 960. Its processor and its GPU are less efficient, and the famous NPU chip (which Huawei boasts so much) first appeared with the newer Kirin 970, which highlights the Honor 9's lack of compatibility with Huawei's AI that can be found today on all new Huawei and Honor models. If you aren't looking for the most powerful smartphone, and if you don't need AI, save the $100. As for the RAM, you have the choice between 4 and 6 GB with both phones. The two devices have some regrettable things in common: they are both incompatible with band 28, ie 700 MHz. This makes the two devices incompatible with certain Free 4G frequencies (they are compatible with others instead: 1800 MHz / B3 and 2600 MHz / B7). In addition, the devices don't offer Bluetooth 5 but only Bluetooth 4.2, which is a shame but in practice it is possible that few users will find it truly lack. The display of the Honor 10 follows the market trend and therefore has a notch, something that greatly displeases some users. Fortunately, it can be hidden by the software, and the large screen manages to fit into a relatively compact body. In addition, Honor had the bad idea to skip the microSD compatibility with the Honor 10, though it is available in its predecessor. In short, this Honor 10 is not perfect. Honor has simply had to make compromises that it feels aren't a problem for users in daily life. Though its detractors make their voices heard, the Honor 10 has been selling very well since its launch. The Honor brand targets young people, and what young people want is to break from the mold and stand out from the crowd. Honor smartphones allow them to do this. The brand uses reflective backs to do this, and even if the Honor 9 had more traditional colors like blue, gray and gold, the Honor 10 really brings originality and fun. As usual, we find the reflective back the brand is known for, but Honor goes a little crazy in terms of colors: the most conservative users will go for the classic colors offered (black and gray), while others who appreciate eccentricity will choose the Phantom Blue or Phantom Green colors. Thanks to the reflections, the colors look different depending on the angle you're looking from, so our blue model looks purple from certain angles. The Honor 10 is at (almost) all levels more interesting than the Honor 9. If you can show a little flexibility with your budget, I recommend the Honor 10. If not, the Honor 9 is still a great device for $100 less than the Honor 10. Choose “Honor 9” or “Honor 10”. That back glass looks mesmerizing! The Honor 10 would be great if not for the fact the brand's phones hardly receive timely updates. It looks amazing but as a huawei user, i wouldn´t recommend phones from this company. No bootloader unlocking and no support nor fast updates.